The first cleaning step of car detailing after the diagnosis phase is what is known as pre-cleaning. Here, using certain kinds of cleaners, coarse soiling is removed from the interior and exterior of the vehicle, particularly stubborn dirt. High-pressure cleaners and special sponge brushes are frequently used here. Some commercial providers also use automated systems while others advertise themselves as exclusively manual cleaning specialists. In this case, pre-cleaning is of course included. If a customer’s vehicle is heavily soiled or presents particularly stubborn dirts, these must first be thoroughly removed before actual car detailing can begin. Mud, crusts and thick dust layers can often be removed using a high-pressure cleaner or a car wash station. A little more dexterity is required when dealing with other types of soiling. For instance, it is easy to clean stubborn dirt from sensitive paintwork with a cleaning putty. Some impurities are eliminated using specifically developed products. These include rust film remover, tar remover or silicon and wax remover. 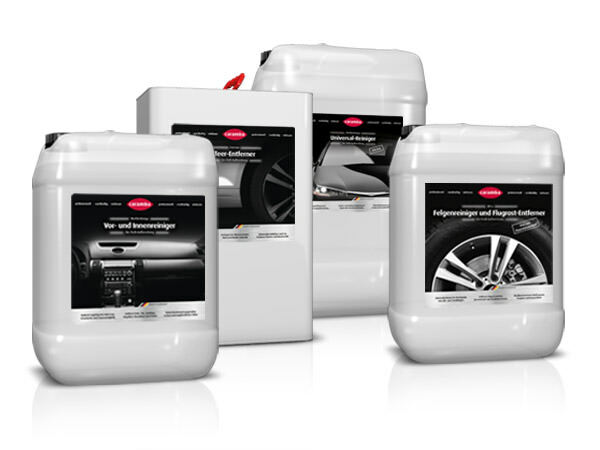 Generally, good car detailing specialists carry those special products for professional users. Once the coarsest dirt has been eliminated, pre-cleaning follows with a universal cleaneror, if necessary, with a special car shampoo. The advantage of a car shampoo is that it’s very efficient and effectively removes street dirt as well as weather and road salt residues – even any dirt that is not instantly recognisable with bare eyes. However, a car shampoo is very gentle on the material because part of the cleaning performance is generated by mechanical pressure, either by hand with a sponge or by the brushes of a car wash station. In addition, many car detailing specialists use a wheel rim cleaner to clean this often very dirty part of the vehicle in a targeted manner. In the process, the type of rims on your vehicle is irrelevant – a good car detailing expert always uses the right resources. After pre-cleaning the exterior, a run-off drying agent is generally applied to ensure non-streaking drying before the following working steps. Of course, the interior is not neglected during pre-cleaning. For thorough removal of coarse dirt and sticky residues in the interior, either a universal cleaner or a special preliminary and interior cleaner is recommended, whose effective force particularly matches the requirements of the interior. This is used to clean plastic surfaces in the cockpit before it reaches the following step of cleaning individual elements and materials. Pre-cleaning in the interior mostly includes removing compacted street dirt in the foot well and stuck food residues or other small food accident remnants which cannot be avoided while using a vehicle daily. Once car detailing pre-cleaning is completed, you will notice that your vehicle looks very clean on the surface. However, that is just the first step toward professional car detailing. Only intricate exterior cleaning and interior cleaning that is matched to sensitive materials make car detailing so valuable. Here, professional service providers use the whole product line of professional suppliers like Caramba to really approach every detail of the very special maintenance.